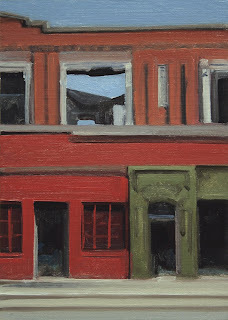 This daily oil painting is of one of the endless stories of Detroit. 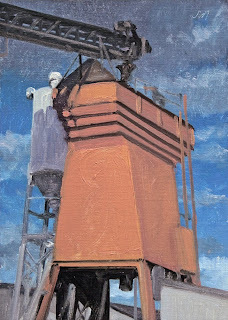 This daily oil painting is of an orange hopper against a spring sky. 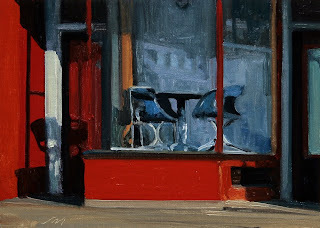 This daily oil painting is of red storefront with great morning shadows. This is the second painting using photo reference from an artist and good friend Jack Summers. I usually only work from my own photos, but Jack gave me some old slides of his to copy, and how can you not want to paint this one. Thanks Jack!. I will be away for a few days and will not be posting. 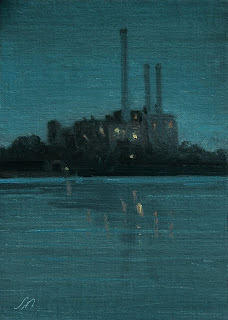 Today's daily painting is a nocturne along the Detroit River. 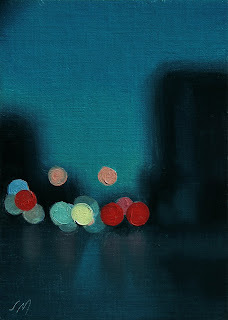 Today's daily painting is the 40th of the Citylights series. It is a view of Woodward Avenue looking South. 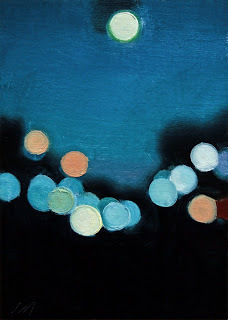 Todays daily painting is the thirty-ninth of the Citylights series. It is a view of Woodward Avenue looking North. 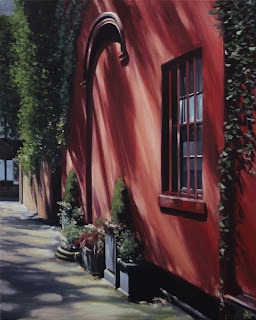 This daily oil painting is of red storefront with great shadows. 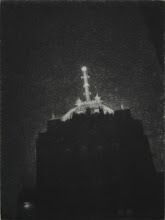 The photo I worked from on this painting is from my good Artist friend Jack Summers. I usually only work from my own photos, but Jack gave me some old slides of his to copy, and how can you not paint this one. Thanks Jack! 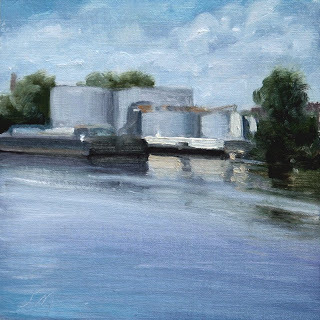 oil on linen/panel, 2009, 7"x5"
Please do not contact the galleries about the small 7x5 paintings. 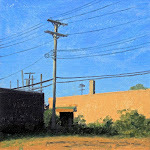 This daily oil painting is of late afternoon sunlight on the beautiful abandoned Mi Central Station. Someone has painted a broken flower on the side of the building blue. The paintings are all ready to be wrapped up for shipment to the George Billis Gallery. 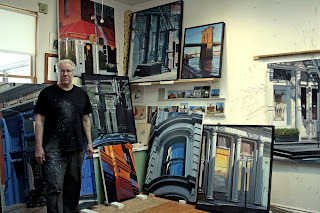 These paintings will be available in the New York show, opening reception: Thursday, April 30th. 6-8 pm at the George Billis Gallery in Chelsea. 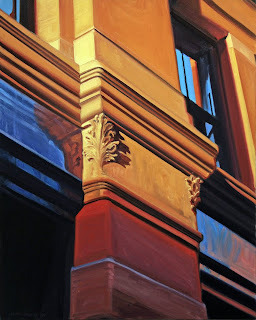 oil on linen, 2009, 30x24""
As with the last post I could not resist all the contrasts of light and dark, warm and cool, and hard and lost edges in this lower Manhattan building. The paintings are leaving today. So I hope to be back doing a few small paintings soon. 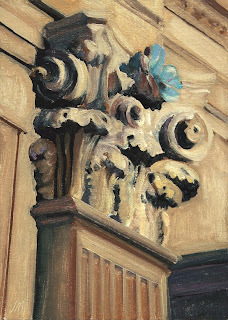 This painting will be available in the New York show, opening reception: Thursday, April 30th. 6-8 pm at the George Billis Gallery in Chelsea. 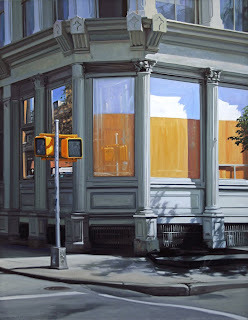 oil on linen, 2009, 48x36""
I could not resist all the contrasts of light and dark, warm and cool, straight and curved, hard and lost edges in this SOHO corner building. I will not be doing any small daily painting for the next few days. 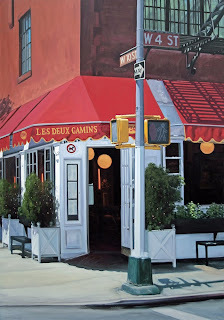 I need to concentrate on finishing up the last few paintings for my show at the George Billis Gallery in Chelsea, NY. 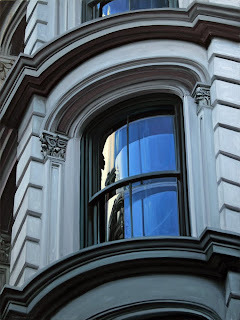 These charming mews were built for the working-class population of the West Village. The Federal style buildings were built in 1853-4 and are a good example of residences designed by builders rather than architects. Also know as Mixed Ale Alley and Pig's Alley. 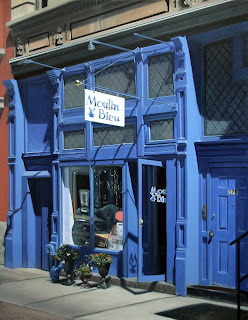 oil on linen, 2009, 62x48""
A wonderful blue Antique store in Tribeca. This painting will be available in the New York show opening April 30th. at the George Billis Gallery in Chelsea. 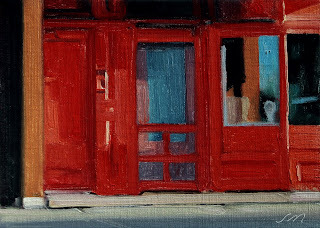 Please do not contact galleries about the small 7x5 daily paintings. 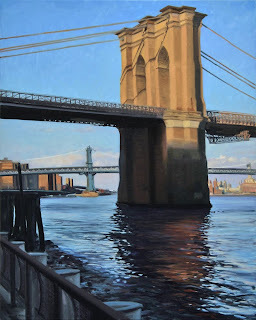 oil on linen, 2009, 30x24"
This painting will be available in my upcoming New York show opening April 30th. at the George Billis Gallery in Chelsea. 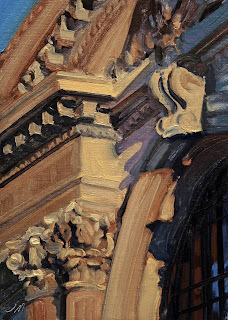 This daily oil painting is of late afternoon sunlight on the beautiful abandoned Mi Central Station. 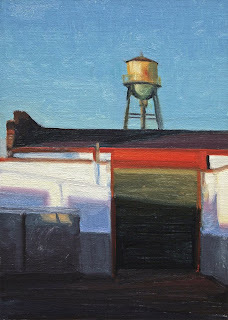 oil on linen, 2009, 60x42"
oil on linen/panel, 2009, 5"x5"
This daily oil painting is of two watertanks against a deep cobalt blue sky. 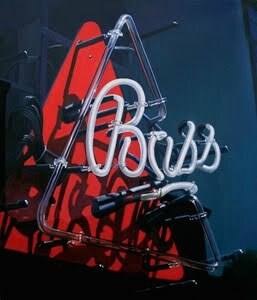 oil on linen, 2009, 62x48"